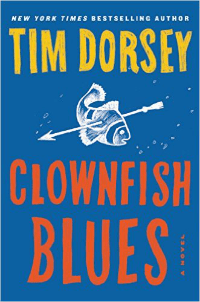 In Clownfish Blues (A Serge Storms Book) by Tim Dorsey, Serge and Coleman are on the road in a Route 66 homage-type expedition. Their plan is to go town, taking temporary jobs at leisure, making sure they hit all of the high points including the bedding of a local that everyone knows happens during the commercial breaks. They soon notice a lottery manipulating scheme with everyone involved from small-town convenience store owners to the big guys. In keeping with their quest, it’s time to get in on the action. Clownfish Blues is the twenty-first book in the Serge Storms series. In Jonny Bails Floatin and the Luck of the Bioluminescence by J. Lee Glassman, Jonny Bails is a Florida street performer when he develops a case of bioluminescence. His lucky new skill and newfound celebrity come with marked disadvantages. Can Jonny find the answers he seeks before its too late? In Trails in the Sand by P.C. Zick, Caroline Carlisle is an environmental writer doing a piece about sea turtles when the BP oil spill happens. Already making people uncomfortable with her relationship with her late sister’s husband, Caroline uncovers family secrets better left in the past. Turtles andTrails in the Sand serve as a reminder that life moves forward. The Riptide Ultra-Glide by Tim Dorsey is the eighteenth book in the Serge Storms series. Serge and Coleman are back and filming a reality show down the coast. Patrick and Barbara McDougall are laid off from their jobs in Wisconsin and they decide to vacation in Florida, a state that holds fond memories for Patrick as he lived there as a young child. Florida isn’t exactly as Patrick remembers. In the meantime, the pain pill market is alive and well in southern Florida and causing a bit of a bloody war. Can the ever-helpful Serge help the McDougalls stay alive long enough to get back to Wisconsin?